Presentation Principle: Audience engagement through interactive strategies is key to a successful presentation. In summer 2014, I had the opportunity to write the Audience Engagement Strategy Book for the American Evaluation Association’s Potent Presentations (p2i) Initiative (available for free download on the p2i website). I’d written about audience engagement strategies before (see here and here), but this time wanted to share specific interactive strategies that come with sets of directions and steps, and that can be customized to fit a presenter’s specific context. 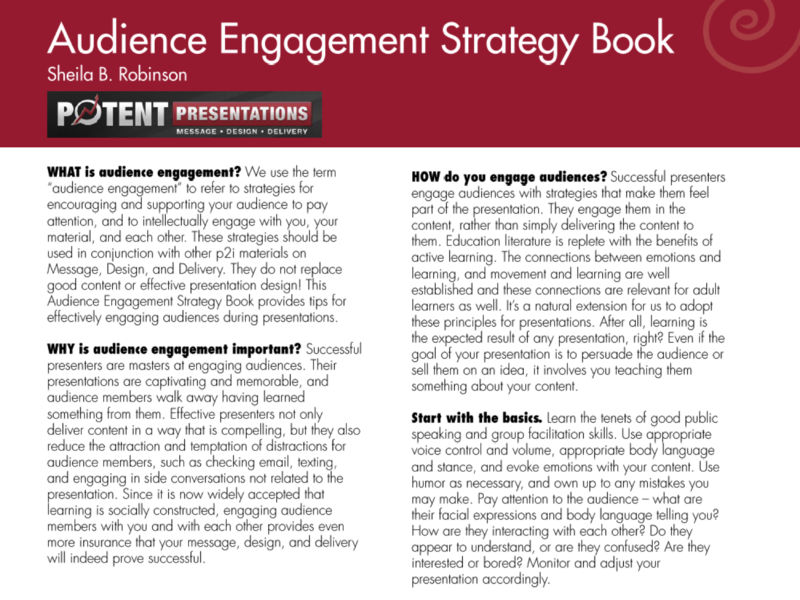 This workbook describes more than 20 audience engagement strategies drawn from literature on effective presentations, and on instructional strategies used in education for engaging learners. It begins with some background – the WHAT, WHY and HOW of audience engagement. Each strategy is then rated on a number of dimensions, so you know what you’re getting into. Audience engagement can be as simple as using eye contact strategically, to preparing specific materials and actually teaching a lesson where participants engage in discussion, reading, writing, sharing, or creating. Being a career educator, I simply took student and participant engagement strategies I’ve learned from years of public school and university teaching along with facilitating professional development sessions, and applied them to conference and other types of presentations. In fact, most K-12 teachers would recognize a majority of the strategies. However, for those who haven’t had the unique pleasure of teaching groups of active, energetic preadolescents/adolescents whose brains are not wired for dry-as-dust lectures, and having to creatively engage them in learning, these strategies may come as welcome additions to your toolbox of effective presentation skills. As with any publication, the second it went out, I thought of more to add. And that brings me to the blog! Look for these additions in future posts. Do you have favorite audience engagement strategies to get participants interacting with you and each other? I’d love to hear about them in the comments!